Given all of our country’s gun problems and controversies these days, I was a bit startled to see a full-page reproduction of an advertisement for “Reliable Revolvers” in an old Sou’wester magazine. Actually, the ad appeared on the back cover of the Summer-Autumn 1979 issue without explanation. It is not clear where or when it originated and I can only surmise that the editor (also not named) of this particular issue felt it went with the rest of the magazine’s content. I had no idea that the rental money from post office boxes once was considered supplementary income for postmasters on the low end of the pay scale. I wonder if that was the case with our wonderful little old-fashioned post-boxes. 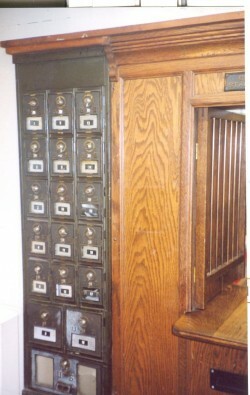 These days, for those of us who have no postal delivery service available, there is no rental fee charged. I don’t know about other situations, but I’m pretty sure that rental revenue no longer goes into the postmaster’s pocket. 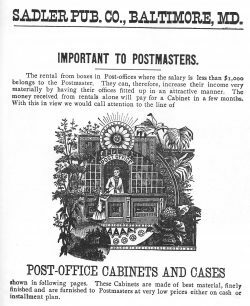 Hopefully, our postmasters make an adequate living wage these days without having to “fit up” their place of work to eek out a bit more income! 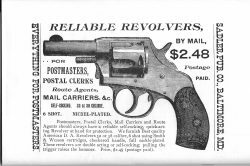 But, back to the “Reliable Revolvers” ad. When I realized that this advertisement was targeting (ahem) postal workers specifically, I immediately thought, “Wow! That puts a whole new spin on the expression, Going Postal.” Perhaps you remember when that phrase originated. It was back in 1986 in Edmond, Oklahoma when 14 employees were shot and killed and six were wounded by Patrick Sherrill, a postman who then committed suicide. And to think that a century or so beforehand, postal supply companies were offering weapons for sale! But now, I’m wondering if it’s a historic tradition among postal employees to be armed. I’m hoping some of my friends in ‘the biz’ will weigh in and tell us that this advertisement is a historic aberration and not since the days of Wells Fargo and the Pony Express have postal workers routinely carried weapons as part of their jobs. YIKES!